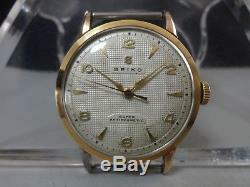 Japan SEIKO mechanical watch " SUPER " in 1956. Movement: SEIKOSHA Suwa factory, hand-winding, ? I did not open the caseback since it keeps fine condition. Case diameter: 32 mm Case material: 14K Gold Filled, Stainless Steel back. Condition: Used, It runs well, +- 1 minute a day. For practical, everyday use, it would be advisable to have the movement cleaned and oiled. It is described on page 2-4, 26-30 of the book Japan Domestic Watch Vol. The item "Vintage 1956 SEIKO mechanical watch SUPER Rare even number dial" is in sale since Sunday, November 18, 2018. This item is in the category "Jewelry & Watches\Watches, Parts & Accessories\Wristwatches". The seller is "saitama_jp" and is located in Saitama.